After much speculation over how much Wii Fit was going to be sold for, the price which was ranging between $69.99 and over one hundred bucks has now been settled. The victor is the in-between warrior cost, $89.99. Basically you're paying almost fourty dollars for that Wii Fit board, but if the game will compel you to get in shape, then it must be worth it. 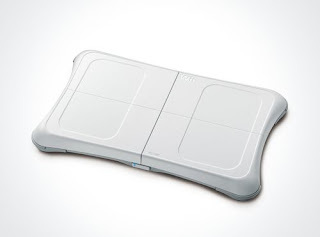 Hit the jump for a bit more about Wii Fit and a special deal. Wii Fit is the game that everyone (and by everyone I mean ryizzel and I) have been talking about. It's designed as an aerobics game with that nifty little board in the picture that you must do all of your nifty Wii Fit activities on. Wii Fit will have over 40 yoga, aerobics, strength training, and balance activities to hopefully give gamers what they need, a game that "provides consumers with a fun, easy and affordable way to incorporate exercise into their daily routines. Turns out though that Miyamoto has no intention of Wii Fit actually making you get into shape. It's main purpose is to get you aware of your body so you can take further steps to better your health. Seriously, check it out. Not only did we recieve a price, but the previously known release date of May 19th is still the same, but with a special bonus to extremely early preorderers. "Along with pricing, Nintendo also announced a special deal for New York customers who pre-purchase the game from the Nintendo World Store in Rockefeller Plaza. From April 18-20, the first 1,000 consumers who place a $5 deposit for Wii Fit will receive a limited edition Wii Fit T-shirt featuring the image and reproduced autograph of Mr. Miyamoto." There ya go New York citizens, you can get a shirt with a fake autograph of Miyamoto himself. Fuggetaboutit.